I just got this yesterday! This amp is my very first tube amp so I can't really give an accurate review on the sound. There seems to be lots of good Youtube reviews, though. She's got the three settings Dark, Normal, and Bright which along with the boost and tone dial is kind of a cool bass-ackwardly straightforward EQ setup. I like it... After all, I am fond of 1930's hi-tech electronics! I will say that the hum of this Electar at all volume levels is pretty prominent. As an owner of tube radios I realize that this is pretty common for my 40+ year old systems, but I have no idea if that is normal for 21st Century guitar amps. And right out of the box there are minor blemishes showing. But please, don't let my criticisms lead you to believe that I am unhappy with this little looker. She is part of the family, minor blemishes and all, and I truly believe that for $400 she is a pretty swell dame. Joe- I use mine for harmonica. Just picked it up and took it on its maiden voyage last night at a blues meetup. Not only did my pals like it, I did too. The startup was a little rocky with a bit more hum than I expected from a modern amp, tubes or not, but it went away once it started cooking and then it gave me everything I needed. With volume at 3-4 and the (boost) footswitch off I could nicely fill with rhythm backup until solo time. Hit the switch and POW! It just flew like a free bird! Totally satisfying for my purposes in small group settings and even tho' it loses a bit of punch in the 'bass' end, the tone control has a nice bright high end setting. Plenty of power, plenty of interesting sound-making features and fun to play thru. My next try will be to mic my Electar 10 thru this amp and see how I sound in that combination. Too much fun. Meanwhile, you're right about the workmanship. I've done a little woodwork in my life and consider myself a better finisher than carpenter. This amp does look great from a few feet away but up close, right outa the box I noticed finish flaws and was quite put off ny the poor fitting of the front and rear panels to the sides as shown on your photos. My grill fabric is nice though; no flaws in that. The manual left more than a little to be desired. 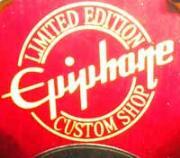 Gibson or Epi should have been more careful to proofread it to make it look like an American product. Misstatements in context, conflicting statements about the warranty, missing informatiojn regarding bias adjustment. Really too bad they printed a manual that detracts from the nature of the amps visual and overall quality which is slightly flawed to begin with. I really hoped the demo at my local merchant (it had the same issues) was an anomaly and mine would be more perfectly fitted together but . . . Nonetheless, great amp for the money and a real looker. And it works well for blues harp. Enjoy it; I do! I didn't even get a manual with mine. (Guitar Center for ya) Anyway, can anyone tell methe tube bias procedure for the thing. I went in and adjusted it so that both tubes read the same on the meter ( VOM ). That made a nice difference in the tone by itself. Great looking Radio and guitars, Congrats on the new amp I love mine as well. All help is appreciated in advance. Thank You. My experience with this amp was not the same. I ordered it many, many months ago and it finally arrived. The build quality is horrible, the amp is way too noisy and it sounds thin. Not anything like I had hoped. Very dissappointed. The fender Pawn shop series of amps blow this out of the water, for similar price point. I love mine. Some of the finishing/trim is kinda rough upon close inspection, but that's nitpicking in my case. The amp is beautiful. It's also very thin, very fragile wood. Very easy to scratch or knock a hole in. I'm using it for rehearsal with my band, plenty of oomph for that and it has a real nice tone imo. In fact, I attached a reverb unit and used the Epi for my NYE gig. Crowded restaurant, diners sitting right in my face, lol. The amp did a bang-up job, got many compliments on the look and power (for its size). Just ordered one from MF. On sale now for $299! Not a restock, second, blemished or used.....regular stock. I hope mine doesn't have the quality control issues others have posted about. Just received it via UPS.It was loaded on a UPS truck at least 24 -36 hours ago. It's been below zero so I opened the box and letting it warm up slowly, then I'll take it out. I want to avoid drastic temp. changes....just like with a guitar. Fully warmed up and unpacked after delivery. Only flaw I see is a very small spot on the grille without stain. No cracks or flaws anywhere on the rest of the cabinet. Looks great! Will turn it on today and start the speaker break in. Will follow up later. Do any of you know what brand of tubes come stock in this amp? (haven't removed the back panel yet). Thanks. Well the 2 12AX7 pre-amp tubes are Ruby's. Still unsure about power tubes. Speaker not fully broken in but I observed the following so far. There is a hum. Only heard when not playing. I'll probably order some JJ pre and power tubes. Some have said better tubes help as well as swapping positions...we'll see. Plated my Sheraton first (2005, Korean). IMO sounded best in the 'normal' input. Dark and bright were good and ok. I don't play much lead so I rarely use just the bridge PU. Next was my '57 reissue Les Paul reissue with a GFS P90 PU in bridge position, Even though it's a bridge only axe, I can get quite a variety of tones using the tone and volume controls on the guitar. Got very good sound with all 3 inputs. Then my Jimmy Vaughn sig. strat. sounded VERY thin with bright input. Acceptable on middle/neck out of phase selected. Pretty good on neck PU alone. The LP is my favorite sound so far. Have a number of others that I've yet to try. Overall, very pleased with the amp. I won't be replacing it anytime soon. More info as it gets fully broken in or with different tubes and guitars.